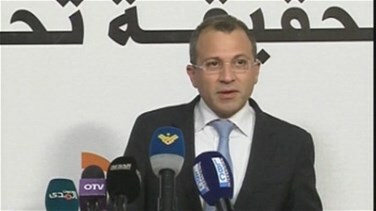 Caretaker Foreign Minister Gebran Bassil stressed Tuesday that the discussions concerning the governmental issue go beyond assigning a ministerial portfolios, stressing the need guarantee the representation of all the political factions in the cabinet and the rejection of the principle of cancellation and isolation. Following the weekly meeting of the Change and Reform bloc, Minister Bassil said from Rabieh that Hezbollah is one of the constants for the Free Patriotic Movement, adding that the relation between the two parties if better than ever. “We reached an agreement with the Future Movement over a national partnership based on the National Pact and we look forward to reaching agreement with the Progressive Socialist Party in order to guarantee the Jabal’s unity,” he stated, adding that they also seek accord with the Amal Movement. In regards to the electoral law, Bassil stressed the importance of passing a new electoral law based on proportional representation, noting that an agreement has been reached with the Lebanese Forces to bring back the Christians into the state. He added that contacts have kick off in order to reject term extension and election according to the 1960s law and to support the proportionality law.